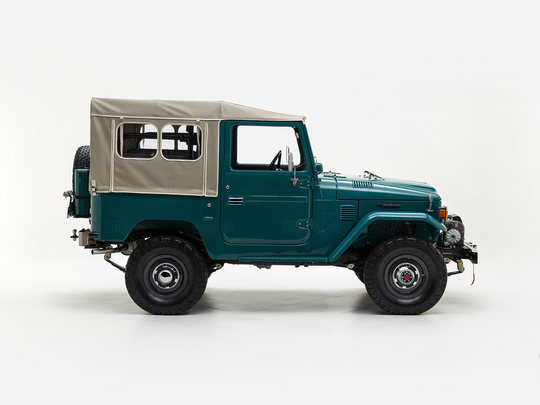 After owning several Toyotas throughout his life, including an FJ Cruiser, our client was finally ready to own the original Toyota 4x4 — the legendary FJ40. He decided to go with our Classic build, which began, as all of our projects do - with a full, frame-off restoration. After everything was inspected and perfected, we began the work of transforming this classic 4x4 into a modern-day machine for our client’s lake home in the New York area. When it comes to pure capability, not all 4x4s, are created equal. Some, like this custom-built FJ40, have the will to climb. This sheer determination is backed by a number of off-road parts and accessories - ARB air lockers, Old Man Emu suspension, a set of BFGoodrich® All-Terrain tires, and a Warn® 8274 winch, just to name a few. These modern upgrades give this classic 4x4 added traction and control - which means less wheel spin on the trail, and smoother sailing on the highway. Look under the hood of this FJ40, and you’ll find the original Toyota 2F engine with an upgrade to Toyota's 5-speed manual transmission. Both are completely rebuilt and ready for decades on the road. Don’t be fooled by this FJ40’s rugged nature. Inside, you’ll find all of the amenities you’d expect to see in a more modern Land Cruiser. Classic knobs and gauges await your command, while the exposed metal dash and vinyl-trimmed seating remind you of this rig’s underlying utility. You control the cabin temperature, while the vintage-style radio plays music from your iPhone® or another compatible device on demand.